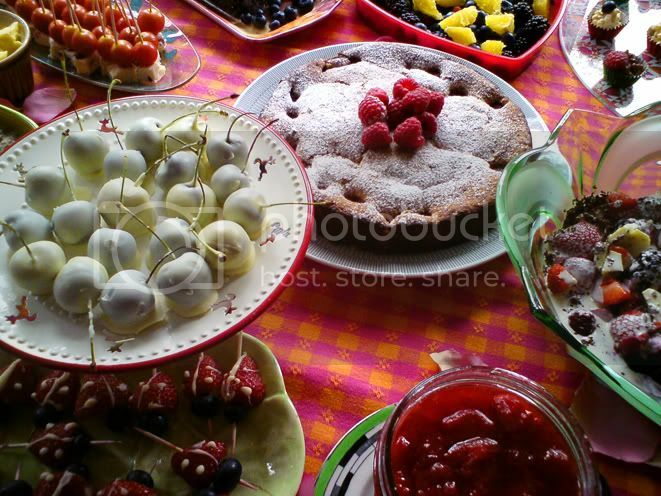 J and her daughter V decided to host the first Annual Whalley Range Cherry Berry Festival at their house yesterday. As the name says, it was all about celebrating cherries and berries and the abundance of great fruit that's around at the moment. Everyone invited was asked to bring along a treat and the table nearly collapsed under the weight of all the fabulous food. Unfortunately, the sun didn't really put in much of an appearance so it ended up being an indoors picnic instead of a garden party, but that really didn't put a damper on things and everyone ended up being high on sugar and/or berry cocktails! One of the fun things was to look for recipes that would be suitable, which took up quite a bit of my time over the last week. Whenever I was supposed to do something that I didn't really want to do, I just started searching the net and going through books and magazines looking for recipes. In the end I chose a Raspberry Buttermilk Cake that I found on another blog. You can see the original on Cookworm. Whisk together flour, baking powder, baking soda, and salt in a medium bowl. With a standing or hand mixer, beat the butter with the 2/3 cup sugar until light and fluffy, about 2 minutes. Add the vanilla extract and the egg, beating thoroughly. Turn speed to low and alternate adding flour mixture and buttermilk, mixing until just combined. Spread batter into your prepared pan, smoothing the top. 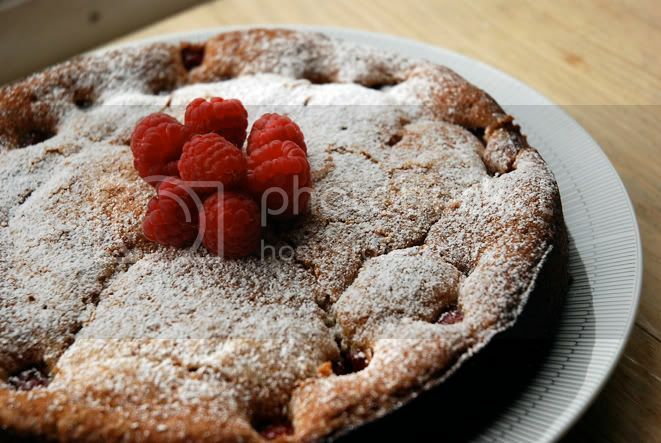 Scatter the raspberries evenly over the top and sprinkle with the 1 tablespoon sugar. Cool in pan 15 minutes, then transfer to a rack to cool completely. Last Friday the weather was really bad and I got absolutely soaked cycling back home from town, so I needed something warm and comforting. I don't usually make soup often during the summer months, but it didn't feel like summer at all and I had a butternut squash that had been hanging around my kitchen for at least six weeks. Soup seemed like the perfect solution. Also my friend JM had been to Brindisa at Bourough Market and brought back some fresh chorizo. Since he and E left for their holiday before they could finish all of it, I was the lucky recipient of the 'leftovers' that they hadn't got round to eating. In addition to that I found a sweet potato in my pantry and threw that in the mix as well. B was also in need of some comfort on Friday so she came round to help me eat the resulting soup. A perfect quiet Friday night in with food, loads of pots of tea and good talk. Place the squash and sweet potato on a large baking tray and drizzle with a little olive oil. Place in an oven at 200C/Gas 5 for about 45 minutes, until the flesh is soft. In the meantime heat a little oil in a large, heavy-based pan and sweat the onions until translucent. Add the garlic and cook for another minute or two. Add the ginger, chili and half of the stock. Bring to a simmer and cook for about 10 minutes. Remove from heat. Once the butternut squash and potato is done, chop them up roughly and add to the pan. If you prefer you can just use the flesh of the buttenut squash by scooping it out with a spoon, but I just use it as it is including the skin. Puree, using a stick blender until smooth and add the rest of the stock until you get your desired thickness. Season with salt and pepper and bring to a simmer. Simmer for a further 5-10 minutes. While your soup is simmering fry the sliced chorizo in a pan. You don't need to add any oil as their is enough fat in the sausages. Once cooked place on some kitchen towel to soak up some of the excess fat and divide between four bowls. 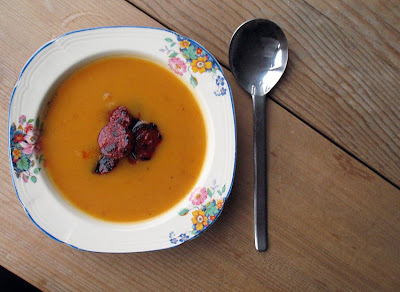 Spoon over the hot soup and serve with some crusty bread. I know it's been a while since I've last posted, but for some reason I've not really been in the mood for much writing. I've also been off sick for a bit, which meant I spent quite a lot of time sleeping and just generally not having much energy for anything. I'm better now though and just thought that I'd better get back to it, especially as I'll be off again on my summer holiday soon, which will mean another dry period. Last weekend I was invited to T's first birthday party. I promised to bring a cake for the buffet. It didn't have to be a birthday cake, as they already had a fabulous one., so I decided to make a lemon cake. I knew that JM was bringing a chocolate one and I like the freshness of lemon cake on a sunny day. 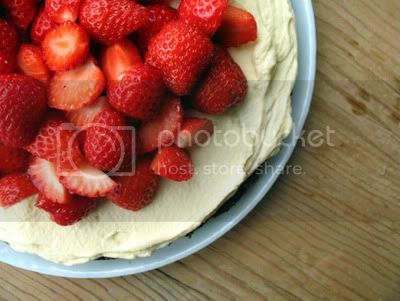 Wanting it to be a little more special for the ocassion I decided to top it with lemon cream and fresh strawberries, which made it that bit more decadent and also looked great. Use the recipe for Easy Peasy Lemon Drizzle Cake, but bake it in a 26cm springform pan, rather than the usual loaf tin to give you the base for the cake. Baking it in a larger tin means of course that it bakes quicker, so it should be done after about 30 minutes. Test with a wooden skewer. Allow to fully cool before assembling the cake. 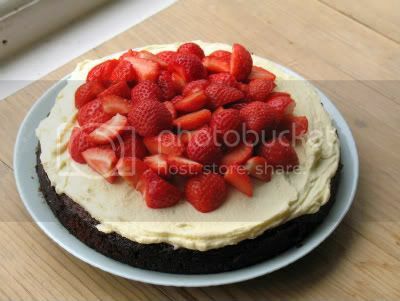 Whip 200ml of double cream (or you can use whipping cream) with 1tbsp of icing sugar. Once stiff, stir in 2 generous tablespoons of lemon curd. Evenly spread the cream over the base with a palate knife. Top with loads of your favourite summer berries. I used just strawberries, which I cut into different sizes, but you could use rasperries, blackberries or blueberries, or a mixture of all. Do you ever find that you've never heard of something and then once you have it crops up everywhere?! Well that happens to me quite often. 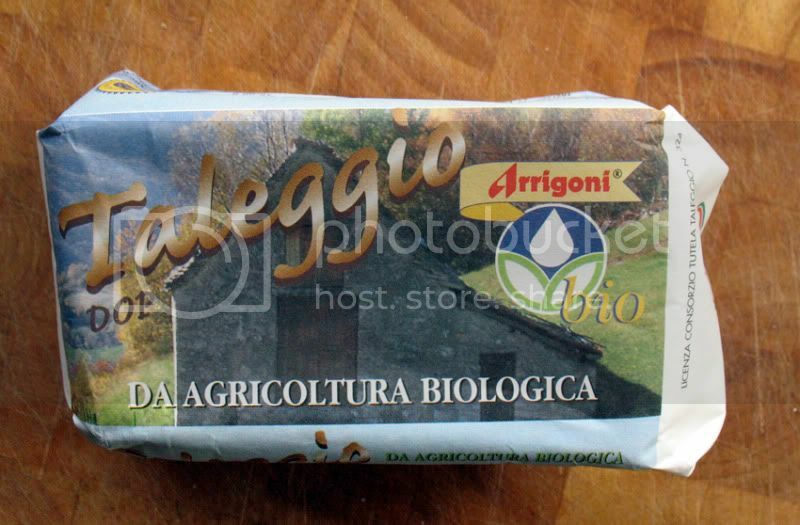 The last occasion was when Abel & Cole sent me some Taleggio cheese to try. I had never heard of it before or seen it anywhere as far as I was aware, but since I got some a couple of weeks ago I've seen it at the cheese monger, which might be because now I am aware of it and looked out for it, but I even found it on the breakfast buffet at the hotel I stayed at in Brighton this week. Taleggio is an Italian soft cheese with a washed orange rind, named after a Val Taleggio near Bergamo in Lomabardy. It definitely has quite a pong to it, especially after a couple of days in the fridge, but it is generally mild with a fresh and fruity taste. The rind has a somewhat stronger flavour, but if you don't like it you can cut it off. 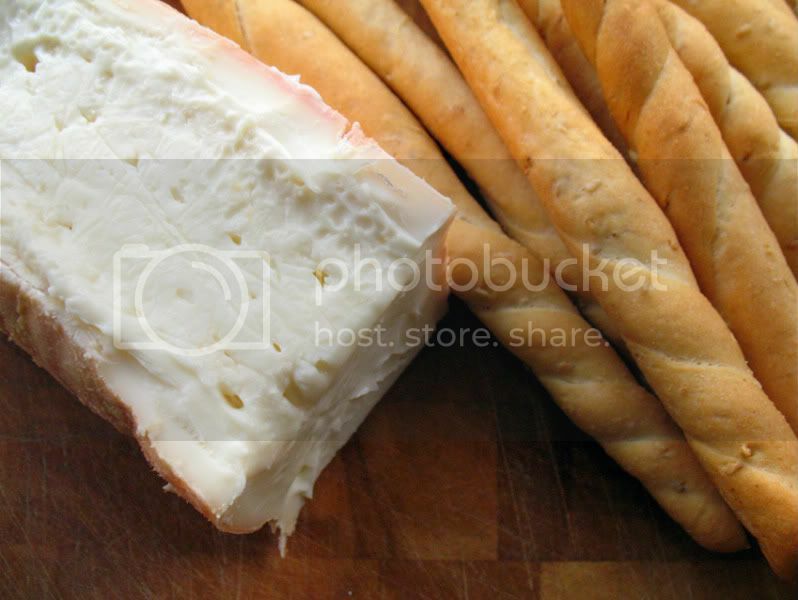 I do like the stronger flavour though and just like with brie or camenbert I eat it just as it is, rind and all. It was gone too quickly for me to try using it in cooking, but I have since found out that it is great for melting over vegetables and polenta or used in risottos.